Rolf Schmidt (center) recently established a scholarship at Penn State Berks for students who are enrolling in one of the college's baccalaureate degree programs upon graduation from Reading Area Community College (RACC). He discusses the scholarship with Chancellor R. Keith Hillkirk (left) and David Delozier, Director of Development and Alumni Relations. Rolf D. Schmidt, a German immigrant and Berks County entrepreneur, has recently committed $250,000 to establish the Schmidt Family Scholarship Fund, a new endowed scholarship for students with demonstrated financial need who are enrolling in one of Penn State Berks baccalaureate degree programs upon graduation from Reading Area Community College (RACC). In addition, as part of Penn State’s new fundraising campaign, A Greater Penn State for 21st Century Excellence, this gift will be doubled by the University’s First-Time Endowed Scholarship Donor Matching Program to provide a total endowment of $500,000. The program provides a 1:1 match for donors who create their first endowed scholarship at Penn State during the Greater Penn State campaign. 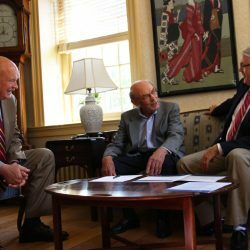 This new scholarship comes on the heels of a recently signed articulation agreement between Penn State Berks and RACC. On April 13, 2017, officials from both institutions signed the agreement, which provides academic pathways to seven baccalaureate degree programs. These academic pathways provide a seamless transfer and serve both institutions’ goals of increasing student retention and completion. According to David Delozier, director of development and alumni relations at Penn State Berks, the new endowed fund will generate close to $25,000 a year for scholarships, which will be available to students as early as the spring semester of 2018. Schmidt, a German-born immigrant and entrepreneur, has indirect ties to Penn State Berks that go back to his early career at Textile Machine Works in 1964. Previously TMW had opened its own training center, Wyomissing Polytechnic Institute. When changes in the textile industry caused WPI to close its doors, the facilities were offered to Penn State for the establishment of a campus in Berks County. The changing textile industry also caused TMW to look into other areas of manufacture and they began making hypodermic needles and suture needles under their new Arrow Products division. TMW was sold in 1968 to North American Rockwell, and Rockwell had little interest in the medical business. Subsequently, Schmidt left the firm and in 1970, he went on to found Sharpoint, a company that manufactured surgical needles, with his brother. Sharpoint began in Schmidt’s Mohnton garage. The first commercial building also was in Mohnton, in 1972 — the present site of Unique Technologies Inc., another medical products manufacturer. The company continued to grow and open new plants in Berks County. Then in 1991, the brothers agreed to a management-led buyout of Sharpoint. The Schmidts continue to be involved in the medical field, as principals in Unique Technologies Inc. and with interests in other promising technologies. Schmidt also has ties to RACC; he led the $2.5 million fundraising drive to build RACC’s Training and Technology Center, contributing another $1 million himself toward the $10 million project. The center was named in his honor. Gifts from Penn State’s alumni and friends have been essential to the success of the University’s historic land-grant mission to serve the public good. To fulfill that mission for a new era of rapid change and global connections, the University has begun A Greater Penn State for 21st Century Excellence, a fast-paced campaign focused on the three key imperatives of a public university. Private support will keep the door to higher education open and enable students to graduate on time and on track to success; create transformative experiences on Penn State campuses and around the globe that tap the full potential of Penn Staters to make a difference; and impact the world through discovery, innovation, and entrepreneurship. To learn more, please contact David Delozier at [email protected] or 610-396-6056.